In January, I wrote about “The 7 Worst Ad Campaigns of 2015” and received great feedback from the community. It inspired me to create this piece—if we can learn from the worst, then we can also learn from the best. In the last article, I focused on advertisements in general. However, this time I’d like to introduce a new theme: branded content, or content that subtly blends into editorial publications and other media communications. Today, such advertisements, which include videos, interactive infographics, and articles, are quickly gaining traction among both brands and publishers. In fact, you’ve probably scrolled through thousands of them on CNN, BuzzFeed, USA Today, etc., without consciously recognizing branded content. Ad blockers have become more popular than Donald Trump, and because both advertisers and publishers are suffering from ad blocking, branded content and native advertisements are being championed as a solution to the overwhelming revenue losses. It’s proving to be a great alternative to traditional banner ads, which users are resisting. Intrinsically, branded content is subtle and indirect. If there were a scale, standard advertisements would be Kanye West, and branded content would be Natalie Portman. Plus, if branded content (usually great advertisements that don’t blatantly promote their products) adds to the publication’s credibility and entertainment value, there’s not much reason for users to continue raising their pitchforks against the advertising industry. Here are five examples of branded content that are more than worth our praise. This launch was an awesome win for all parties involved: The New York Times received more downloads for NYT VR in the first four days than any other Times app in history. It was a revitalizing victory that put The Times back in the forefront of the conversation. Google, which has been marketing Google Cardboard the last couple of years, garnered one million new users in just a few days. GE and Mini were not only able to share their brand with over one million users, but they were also able to engage them in a way that their competitors could not—that is, by utilizing the emotional, powerful, compelling nature of virtual reality storytelling. In the film, Doc Brown’s DeLorean runs on garbage for fuel, an environmentally friendly alternative to expensive, scarce petroleum. Naturally, Toyota, which developed a hydrogen fuel-cell car called the Toyota Mirai, figured they could use “Back to the Future Day” to their advantage. Toyota recruited Michael J. Fox and Christopher Lloyd to promote the Mirai in a nostalgic advertisement and began selling the Mirai on “Back to the Future Day” itself. In the five-minute commercial, Mischa (the brains behind the Toyota Mirai) sits down with Fox and Lloyd to explain how the Mirai transforms trash into hydrogen fuel—sprinkling in Back to the Future imagery and metaphors while the iconic score plays in the background. It’s entertaining, sentimental, educational, and you can’t help but smiling the whole way through. The Lego Movie is perhaps the best example of branded content I can think of—and as leader in the advertising industry, I’ve seen my fair share. It seems, on the surface, like one long, hilarious advertisement for Legos, but really, it goes much deeper than that. It’s heartwarming, touching, and associates the Lego brand with important life lessons, such as remaining true to yourself and encouraging creativity, imagination, and innovation. It was written by Chris Miller and Phil Lord (Cloudy With a Chance of Meatballs, 21 Jump Street) and featured a star-studded cast, including Will Ferrell, Morgan Freeman, Will Arnett, Chris Pratt, and Alison Brie. It was, in simple terms, an excellently crafted, entertaining ninety-minute advertisement. Now, after seeing the movie, children everywhere (and adults too, for that matter) are able to connect Lego to timelessness, ideals, and warm thoughts—something more than just a yellow, Danish product. While we’re on the subject of adults, The Lego Movie was incredibly nostalgic for them, reminding them of happier, less jaded times. In other words, The Lego Movie hit all demographics: male, female, children, and grownups. If you didn’t leave that movie ready to purchase your children a brand new Lego set, then I’m not sure where your heart is. In 2012, Gatorade launched its “Win from Within” campaign. More recently, Gatorade revived the campaign with a series of commercials featuring inspiring athletes, from Serena Williams to Abby Wambach. In addition to household names, however, Gatorade interviewed several lesser known yet equally impassioned athletes, like Jaide Bucher, for example. Jaide, a fifteen-year-old high school varsity softball player, was born with one hand—but, as we learn from the short five-minute commercial, her strength, motivation, and determination are unrelenting. In this inspirational series, Gatorade demonstrates to its audience that with courage and strength of character, anyone can shoot for the moon and achieve their dreams. Gatorade is encouraging a younger generation to believe in themselves, work hard, and succeed, while emphasizing that Gatorade, as a brand and energy drink, will by their sides each step of the way. This is a powerful branded message. Through inspiration, and by tying a girl’s story to their product, Gatorade is creating a generation of enthusiastic brand ambassadors. If you’ve watched Jaide’s commercial as many times as I have, you’ve probably gone home early, eager to follow Jaide’s footsteps and get back to realizing your childhood dream. Still, the Silentó hit didn’t get popular overnight. Rather, it had behind-the-scenes help from DanceOn, a digital network cofounded by Madonna that promotes dance content. CEO Amanda Taylor approached Silentó, asking him for permission to make unofficial dance videos for the song. Then, she invited fifty DanceOn members to film their own versions of the video. In three months, those fifty members drove 250 million views to their personal videos. The rest is history. Clearly, DanceOn’s efforts were essential in the success of “Whip/Nae Nae.” Its content was so catchy that it created a dance revolution last summer, growing DanceOn to 1,200 “influencers”—and I’ll bet you didn’t know that DanceOn and Madonna were behind it all. 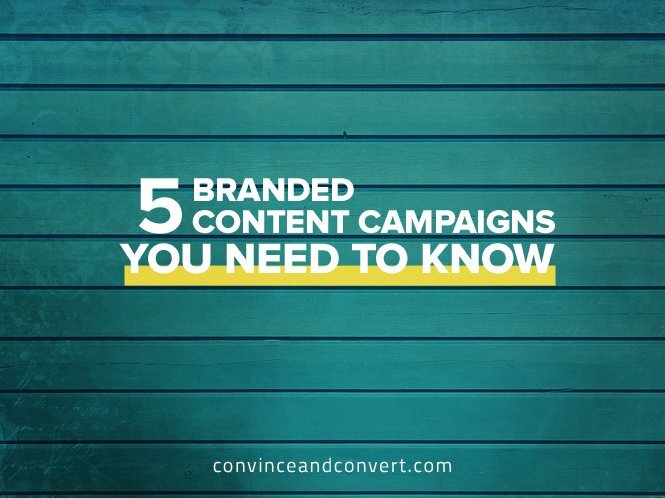 The number of great branded content examples out there continues to grow as more and more publications and brands adopt this creative strategy, and they’ll only get better with time. Brands must respect and empower their audiences in order to drive successful advertising campaigns, and branded content that encourages engagement and positivity is a worthwhile remedy. Who knows how this branch of advertising will develop, and what else the industry will innovate to captivate users? Moti Cohen is the CEO of Apester, a digital storytelling platform for brands and publications.